A restoration work at Nizami metro station has been completed. The station, which was commissioned on December 31, 1976, is located in the geologically complex region of the capital. As a result of the aggressive environment over its 40 years of activity, station installations, constructions and decorative-architectural elements have become completely useless. The station was partly-closed for renovations. Restoration work went through several stages without completely limiting the movement of passengers. Marble walls were renewed, partitions built on the platform were subsequently demolished. Platform walls and collectors were strengthened, while service rooms were repaired in accordance with modern requirements. 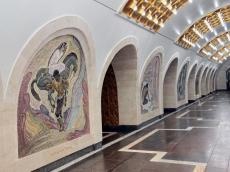 Design of the metro station, named after the great Azerbaijani thinker, poet and philosopher Nizami Ganjavi, samples of national architecture were also restored. Notably, the lifespan of the escalators at the station ends in 2025. Therefore, the replacement of escalators at the station and major overhaul will be realized in the future.